The new black wire going to the fuse block is coming off the battery and is fine not hot. But the red wire coming off that fuse block was hot as can be but the rest of the red wire going to the relays is fine. The relays them self were just maybe a tad warm but not hot and all the other wires were cool. Not sure what to replace? Fuse was a 40Amp after talking to my tuner he mentioned 40 was too much drop to a 20A. So I have a pack of 20s coming in. Anything else I should change? If the red wire (labeled A) is hot yet red wire (labeled B) is not should I run wire B to the fuse block? Have not experienced any fuel pressure issues at all. 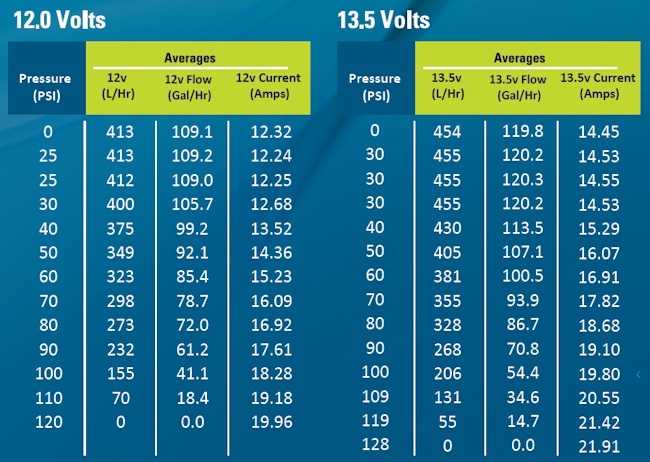 Is your ground wire the same gauge or larger than your positive wire coming in the relay? I know for me when I was using the standard 30a relay for my Walbro 450 it would get very hot to the touch but once I switched over to the 75a Bosch/Tyco high current relay, that problem went away. 1 wire is the same, other is I’d say one gauge larger. What fuel pumps are you running? I assume two because you are using two relays. You need to lookup the amperage rating of your fuel pump you are using. For instance this is the popular Walbro E85 pump. With your car running and the alternator working, this pump is going to see about 13.5V which is 15.29A at base fuel pressure (assuming your regulator is set to 43psi, I'm looking at 40psi in the chart). Then you need to figure out how much boost you run. If you run 25psi boost, you need to add that to the base pressure. So 40 (really 43) + 25 is around 65-70psi. On the same chart it shows 17.82. Lets call it 18A under full boost per pump which means 36A for both fuel pumps. You need to make sure whatever relay(s) and wiring you are using are capable of handling that amperage rating. If you are using two Supra fuel pumps, I believe they use more power than the Walbro. If you are running 1 wire and splitting it to two relays, the single wire would need to be rated for both fuel pumps, and the wires after the split can be rated for 1 pump. Also make sure you have a good ground to the fuel pump assembly. Dual 450s. While they are staged I haven’t hookup up the trigger wire from the standalone. So car is only on 1 pump. Tonight I’ll be checking everything with a multimeter. By that chart it seems I fall with in norms. So something is wrong at the power wire coming off of the fuse block to the relays. Last edited by Brando x DJG; 04-15-2019 at 07:55 AM. All wire is not created equal either. Some companies will advertise wire as being 4 gauge for instance but really it's more like 8 gauge and it just has a thicker coating on the outside. I'm not sure what your size is. It kind of looks like 8 gauge which should be fine for 40A over that short of distance, but maybe it's not really 8 gauge. Here is a sizing diagram. Also depending on where your battery is located, I you may want to relocate your fuse. If your battery is in the hatch, your fuse location is fine. If it's up front, then I'd move the fuse up front so it's near the battery. 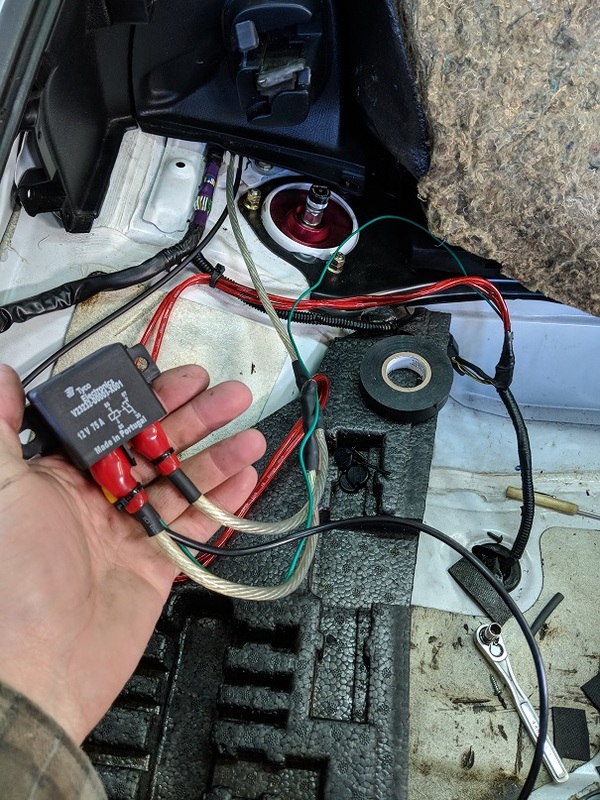 That way if something happens (like the coating of the wiring wearing against your firewall or something in the middle of your car), the fuse blow and the wiring will be protected. Here's a pic of the wiring that came on my car. I've only had the car for a few months and it has been fine. I added protection to the exposed terminals, and cleaned up the wiring some, but I am going to swap it out for some higher gauge wire for peace of mind. 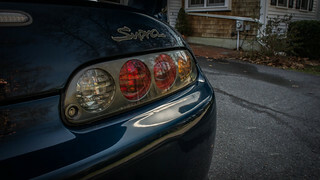 I have twin oem supra pumps which draw more amps than the 450's. 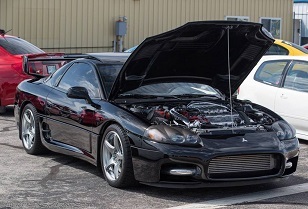 98 GS400 For Sale... HOT HOT HOT! !